We’d love your help. 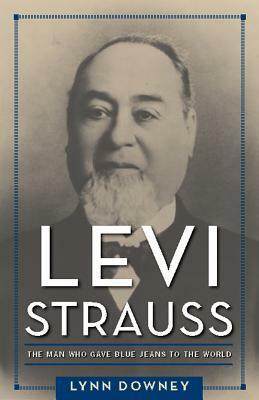 Let us know what’s wrong with this preview of Levi Strauss by Lynn Downey. As a young man Levi Strauss left his home in Germany Blue jeans are globally beloved and quintessentially American. They symbolize everything from the Old West to the hippie counter-culture; everyone from car mechanics to high-fashion models wears jeans. And no name is more associated with blue jeans than Levi Strauss & Co., the creator of this classic American garment. To ask other readers questions about Levi Strauss, please sign up. Levi Strauss didn't invent blue jeans or denim or even the copper rivets used to keep the pockets from tearing. But he did know a good thing when he saw it and was able to market copper-rivet pants, along with other sturdy clothing, throughout the West. Unfortunately, Mr. Strauss left no heirs and any letters or diaries or notes he may have taken were lost in the fire that swept through San Francisco in 1906, four years after his death. Lynn Downey, who was the first in-house historian for Levi S Levi Strauss didn't invent blue jeans or denim or even the copper rivets used to keep the pockets from tearing. But he did know a good thing when he saw it and was able to market copper-rivet pants, along with other sturdy clothing, throughout the West. Unfortunately, Mr. Strauss left no heirs and any letters or diaries or notes he may have taken were lost in the fire that swept through San Francisco in 1906, four years after his death. Lynn Downey, who was the first in-house historian for Levi Strauss & Co., used contemporary sources, such as the local newspapers in San Francisco, patent documents, advertisements, and other literature to paint a portrait of Mr. Strauss and San Francisco from 1860-1902. She traces his family history, their immigration from Bavaria to New York, then to San Francisco; from peddlers to dry goods wholesalers to a clothing empire. Levi Strauss & Co. made more than denim jeans, outfitting even prisoners in Folsom. Mr. Strauss was an integral part of San Francisco society as well, including the Committee of Vigilantes, and contributed to charities through his temple and other organizations (he donated to three orphanages: Jewish, Protestant, and Catholic). He employed a lot of women and paid them a decent wage (for the time). He was a "hands on" person, appearing in advertisements, showing up at the warehouse, and inspecting samples. Although he had no children of his own, his nephews and nieces--the Sterns and the Haases--are still engaged in charitable works in the Bay Area. Ms. Downey does a good job with the limited material she had. What the book lacks in personal "inside" information about Mr. Strauss, Ms. Downey does a wonderful job capturing what it was like to be an entrepreneur during the early days of San Francisco. I was fortunate to be able to visit the historic factory on Valencia Street in San Francisco back in the mid-1990's. The factory was no longer making jeans for sale, but was used to develop prototypes and test different fabrics. The company donated enough "remnants" of denim, along with buttons and thread, to make vests for about 150 Cub Scouts at our District Day Camp. There was enough left over to use for another craft project the following year and to share with other Districts. Levi Plaza on Battery Street, near the Embarcadero in San Francisco, is a wonderfully landscape park as well as company headquarters--an oasis open to all. This book was well written on both the man, Levi Strauss, and his part in the history of jeans in America. It also serves as a very informative history of Northern California, specifically San Francisco. I'm a second generation Californian, a historian of the West, and I aspire to be a full-fledged desert rat. I practice frequently on visits to Nevada and Arizona where I scour the desert for history and stories. My next book is "Life in a Lung Resort: The Story of Arequipa, California's Sanatorium for Working Class Women." It's a history of the place where my grandmother and hundreds of other women I'm a second generation Californian, a historian of the West, and I aspire to be a full-fledged desert rat. I practice frequently on visits to Nevada and Arizona where I scour the desert for history and stories. When I'm not writing I work as a consulting archivist, historian, and curator and have spent time at some great organizations: Charles M. Schulz Museum (Santa Rosa CA), Desert Caballeros Western Museum (Wickenburg AZ) and the Chemehuevi Indian tribe (Lake Havasu City AZ). Future books will include the history of the Yavapai tribe in Arizona and how an infamous massacre changed their world; a short history of an almost-ghost town in Arizona; and a historical novel set on an Arizona dude ranch (are you seeing a pattern here?). Then, just to be different, I'll also publish a memoir of the three years I spent in a San Francisco religious cult.